January 2019 was taken on the characteristics of last winter; very low temperatures until precipitation was in the forecast at which point temperatures would rise and we would see rain. As we past the mid-point of the month it really looked like we would be able get some winter activities in with 12 to 16 inches of snow predicated. Alas, we received 9 inches of snow, sleet, and freezing rain. 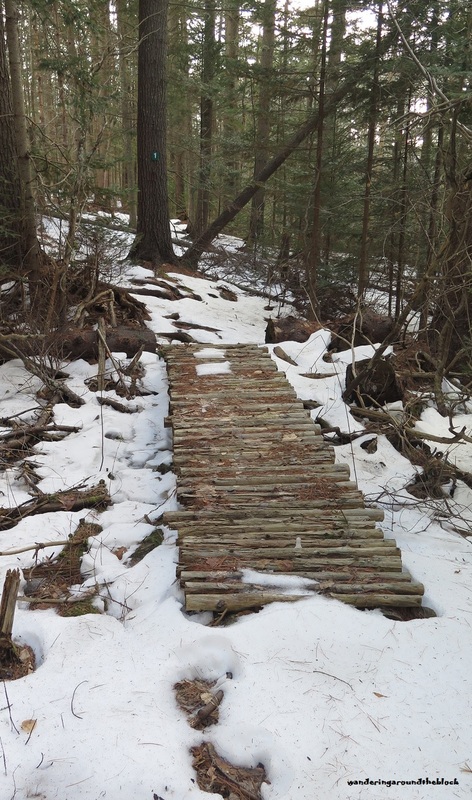 There was enough white stuff on the ground that my husband decided to dust off the snowshoes and go on his own adventure before the 1 inch of rain came in 2 days later. Unfortunately I could not accompany him and hoped that the weekend would still provide decent conditions. By the end of the week, there was still something white on the ground, so we threw the snowshoes and the spikes in the car and decided to test the conditions at Merryspring. After studying the field nearest the parking lot, we knew that there was not enough snow on the ground for snowshoes but did we need the spikes. We first opted to go without the spikes but after both of us slipped after just a few feet we donned the spikes and set off on our walk. Once we eliminated the fear of falling, we set off on the perimeter trail, designated with blue tags on the trees labeled “1”. These were new markers and stood out much more clearly than the old wooden posts with faded numbers on them. It certainly was a beautiful day! The sky was a near perfect blue and the sun was illuminating the tops of the trees. That highlight on the trees always makes me pause. A little further on, we hesitated once again to study the old stone well and stream below us. Soon, we noticed that there were small signs identifying the nearby trees. Oh horror! We were in the arboretum section of the preserve. The trail designations in this area used to be “a1” thru “a7”. Every time we have been here, we have struggled to find our way back to the perimeter trail, passing “a3” or “a7” numerous times before locating the correct path. Over this past year however, extensive trail work had been done in this area, so we soon noticed that the arboretum section was designated with colored blazes (again more visible that the old wooden signs) and we quickly located our blue “1” tag. 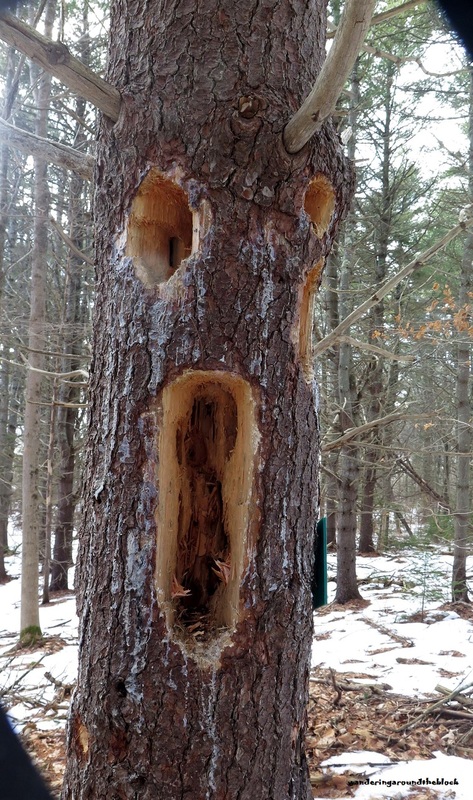 Once we were safely back on the proper path, I noticed a tree that had been attacked by some serious pileated woodpecker activity. Peering inside these holes, I could see daylight coming through the tree. The face left behind by this artwork did seem to express some astonished dismay. Near the end of our journey, we passed by a very wet area now frozen. We could hear the ice cracking and paused to observe the upheaval of the melting ice. We did try but the pictures did not do justice to the beauty of the scene. It was just one of those things that had to be experienced in person. 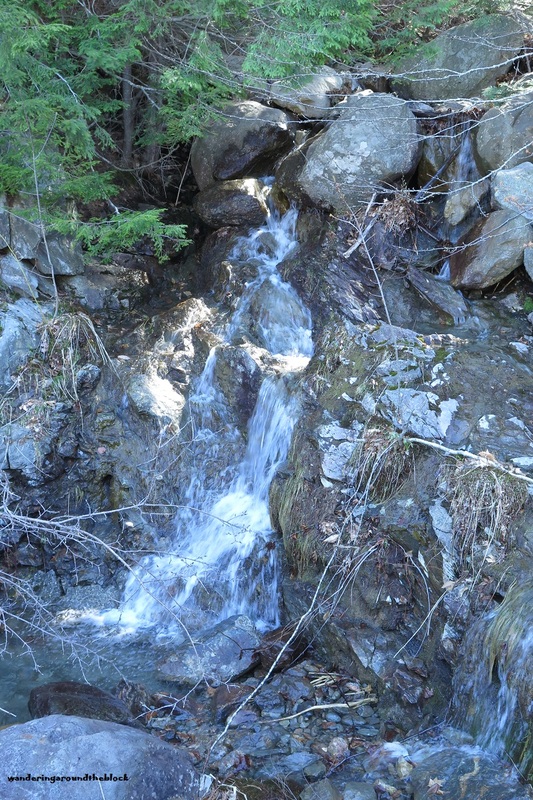 During my travels over the past few years, I have frequently passed a pullout along the road, with a waterfall that rushes in the spring and trail nearby. Out of curiosity, from time to time I would research this area, trying to find some information about this trail. Although I could locate the two named trails on either side of this little road, I could not find this hidden path on any trail map of the area. Still, that had not stopped me from vowing to explore this area some day. 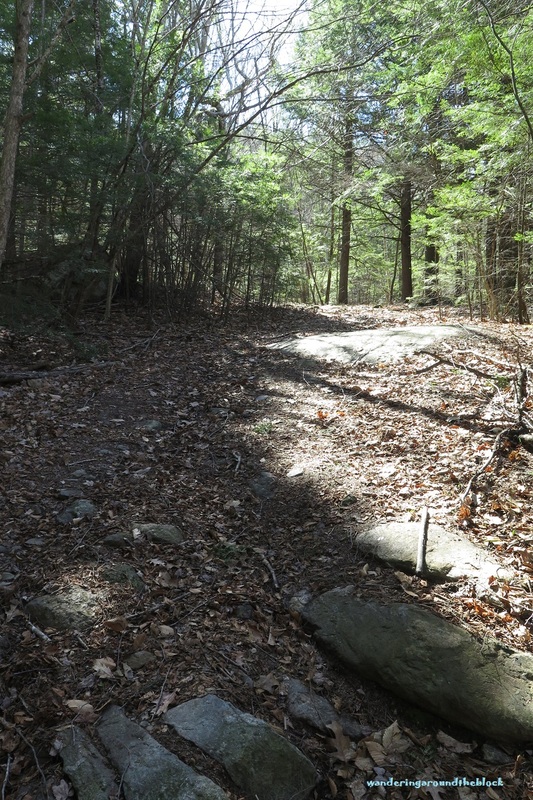 Recently, one of our neighbors had informed us that the trail eventually intersects with one of the official trails in the area and that was enough for us to explore this path on the first nice weekend in May. We parked at the pullout near the waterfall and headed into the opening of the woods. Once we were a little ways from the road, it was obvious that this was a well-used trail. At this point it was wide enough to have been a road at some point in time. Further along, we had to decide whether to continue straight or branch off in either direction. We had been told that the left would lead to a sheer rock face so we explored the right passage only to discover that it dead ended at a meadow like ledge. 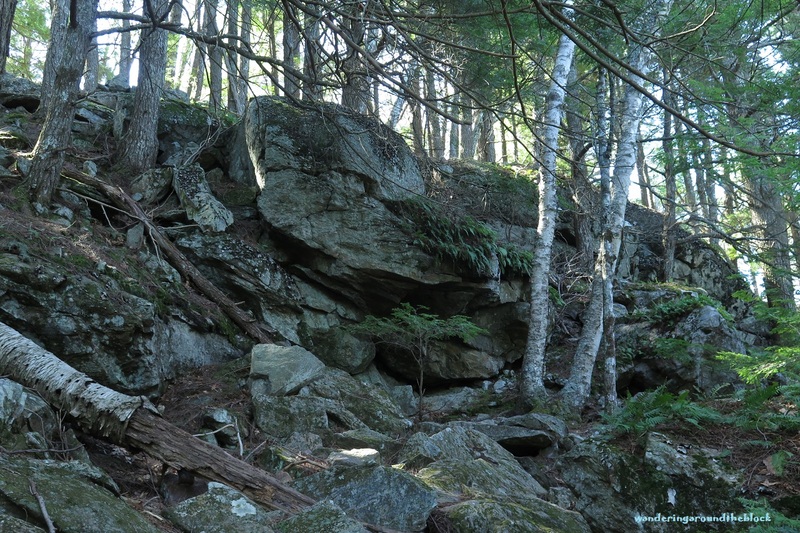 We returned to the fork and continued on the straight path until we reached a boulder pile in front of us. Once again the trail branched off in either direction, so while my husband made his way up the rocks to explore, I headed to the right to see where the road would lead. Again I reached a dead-end, so I retraced my steps and followed the lane in the opposite direction. Not far along, I saw that the route seemed to head down into a bowl shaped landscape. I did not feel the need to take the steep descent and climb so I returned to the rocks. 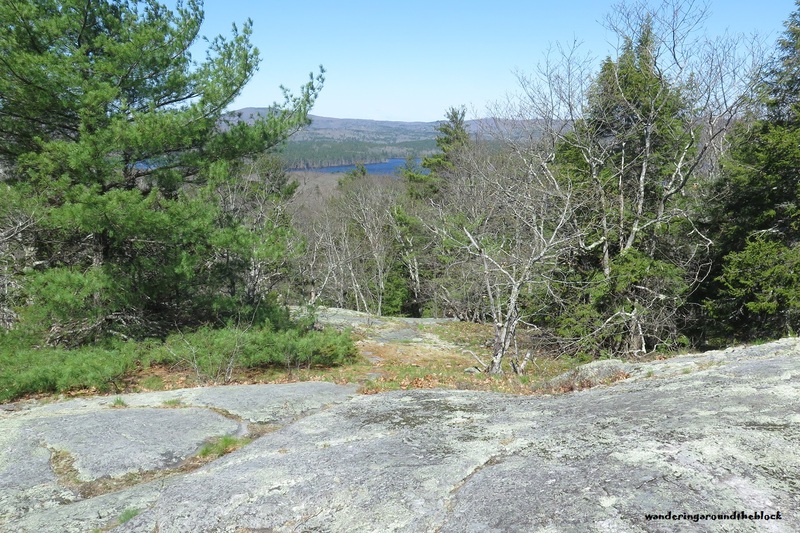 I climbed up the rock field to join my husband on a ledge with wonderful views of the lake below and the mountains beyond that. We walked across the ledge and soon discovered that the trail continued. Along the way, we passed evidence that someone had camped up here at some point in time. The direction we needed to take was still pretty obvious but shortly after this point we realized that someone had tied ribbons around the trees to mark this unofficial road. We followed these ribbons for about an hour before my husband announced that we had reached the intersection with the named trail. We decided to continue on the blue blazed trail to the left, knowing that it would lead to some wonderful views of the lake. Along the way we stopped to admire the wildflowers that were just beginning to bloom. 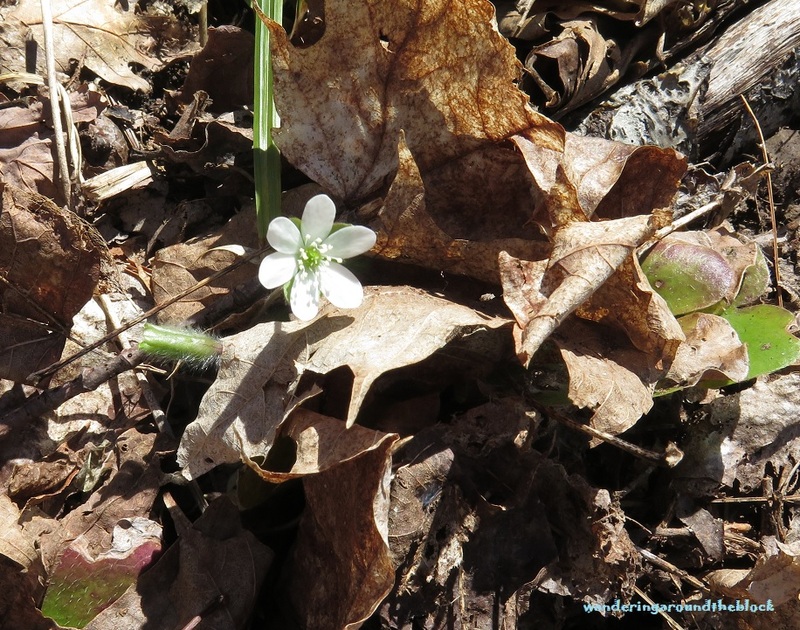 I spotted Wild Sarsaparillas, Yellow Violets, Bellwort and white Hepaticas. None of these flowers were interspersed with each other. Instead they each seemed to dominate and blanket different regions of our walk. I found a few areas that seemed a little difficult to hike and it wasn’t long before I realized I was done. Unfortunately, we had already been hiking about 2 hours. To turn around meant hiking another 2 hours back to the car, so we continued on not knowing how long before we reached the intersection to the trail we had walked many times before. After a while we reached the trail marker indicating our scenic spot was another three tenths of a mile on or we could head down to the parking area which was another 6 tenths of a mile. At this point, we decided not to head to the high point of the trail and add a ½ mile to our trip so we turned towards the parking lot. Once in the parking area, I rested on a flat concrete block while my husband walked the short distance up the road to get the car. After 3.5 hours we were ready for lunch. I know the winter holiday season was several months ago but I still have to proclaim that this past Christmas I received one of the best gifts ever; time with my daughter learning something new in a hobby we both love. Quilting, of course! My daughter had signed us up for a class to learn foundation piecing, using a Judy Niemeyer pattern. It was a technique that I have been interested in for quite some time but I just hadn’t taken the plunge to seriously investigate it. Even though I knew I could hunt online for any number of videos that would show me how to learn foundation piecing, this was one of those things that I really needed to be shown in person. So, near the end of January, my daughter made the trip up the day before so we could get an early start on the hour and a half drive to the full day class in Bangor. 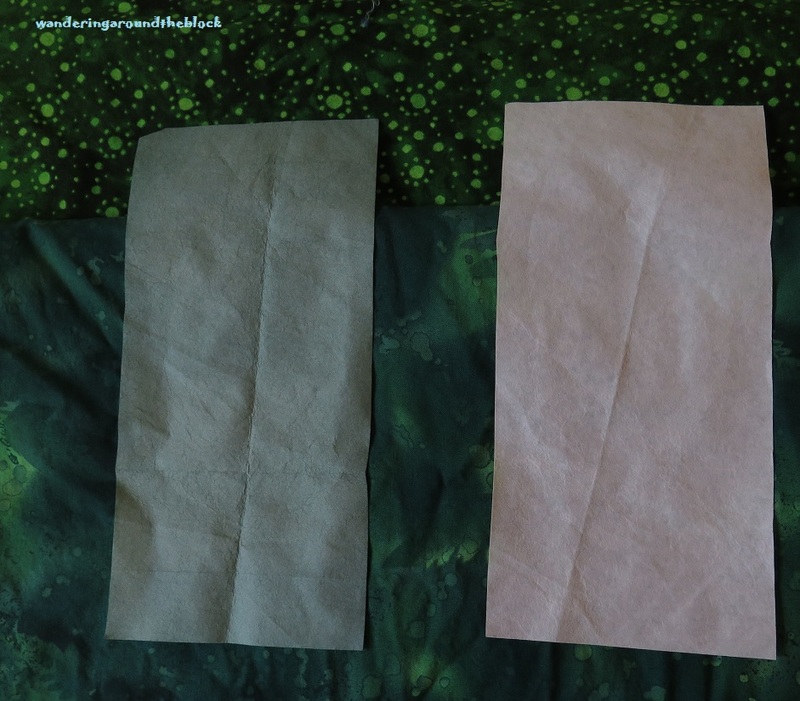 Prior to the trip, we had cut 10 inch squares of dark and light fabrics so we would be ready to cut everything to the templates during our lesson. 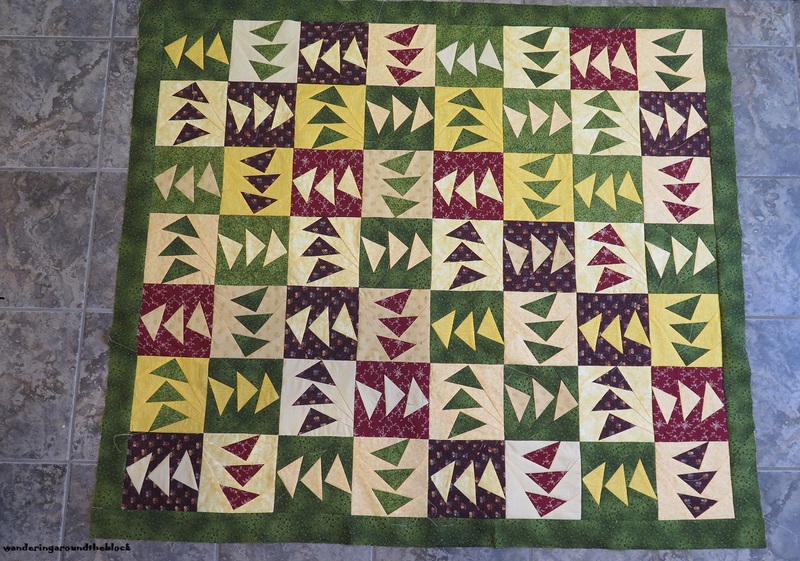 I had chosen to make this a scrap quilt with a variety of yellows for the lights and a combination of greens, reds and browns for the dark. My daughter opted to make a black and white quilt. The first thing we did during the class was to cut our squares into the individual block pieces using the 10-inch template. Then we switched the dark triangles to the light pile and the light triangles to the dark pile. We were now ready to assemble our first block. And that was when things got interesting. Our instructor showed us how to glue the first piece to the paper, trim it to a quarter inch, pin the second piece and stitch it to the first piece on the foundation paper. Sounded easy but oh contraire! It must have been a spatial problem because it took me the better part of the class to complete one block. I just could not wrap my head around the fact that we were attaching the pieces to the back side of the paper and stitching along the front. In other words, when looking at the marked side of the paper, I was actually looking at the back of the block not the front. I had to constantly check myself before stitching to make sure I had the right side of the fabric facing away from the paper. 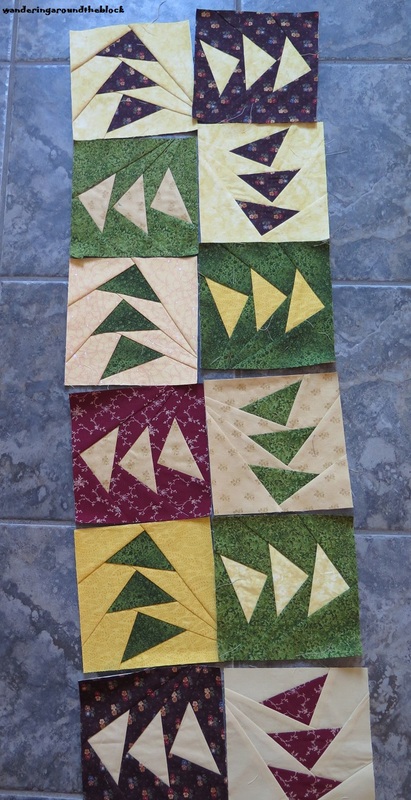 I finally had my Eureka moment by early afternoon and went on to finish another 4 blocks before the end of class. I believe my daughter finished 6 blocks by the end of the day so all in all it had been a productive day. Once home, I kept creating blocks over the next couple of days so that I would not forget what I had learned. I completed piecing my “Follow the Leader” quilt sometime in March. I would have to put this quilt away for a time before I decided on a hand quilting pattern for it. Time was short and I had an approaching deadline on a baby quilt for a friend. During the first weekend in December, the temperatures were still fluctuating between a balmy 50 and more seasonable night-time lows in the 20’s. On one of those spring like moments, we decided to explore a section of the Gibson preserve. Since the two sections of the preserve were not connected, we opted to explore the larger area, leaving the 1 mile trail for another day. Our exploration for this outing would also give us the option of exploring a portion of the Ridge to River trail if we so decided since the two trails were directly across from each other. First, we had to get to the trail-head. The directions on the Georges River Land Trust site indicated that after turning on to Ripley we should park off the road, walk across a bridge and veer right at the fork. Unfortunately, we misinterpreted the road as Riley and had to turn around when we reached the second section of the preserve. Once we corrected our mistake, we made our way to the dirt road that would lead to the two trail-heads. Well, it may have been dirt lane at one time. We stood for a moment, gazing down a long river before making our way alongside this large expanse of water. The thought crossed my mind that I would sure hate to see what this preserve looked like during the wet season, not only because of the water but I also thought about the number of black flies and mosquitoes that must inhabit this area! Examining our map, we decided that we would be able to create a nice loop by combining the Orange, Yellow and Blue trails. Once on the orange trail, we found the ground was still spongy beneath our feet. In fact, most of Gibson consisted of a lush ground cover of a variety of mosses. Not far into our walk, we found a downed tree covered in Beard Lichen. The long whitish-green hairy growth was lovely to behold. 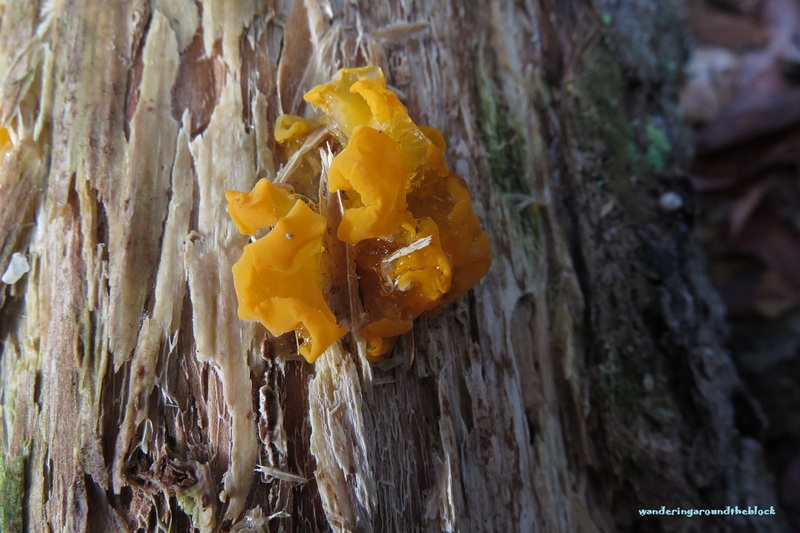 Directly across from this artwork, I found another fine specimen of the orange jelly fungus I had first seen during our exploration of the Mount Pleasant preserve. 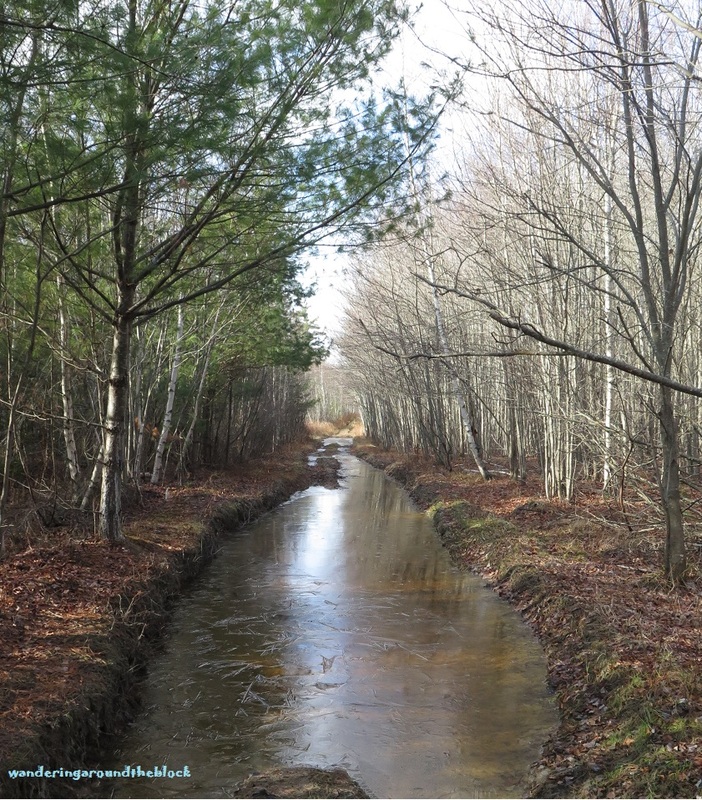 Not long after our discoveries, the orange trail began to follow the St. George River. From where we stood, I assumed that we were looking at the second section of Gibson preserve just across the river. 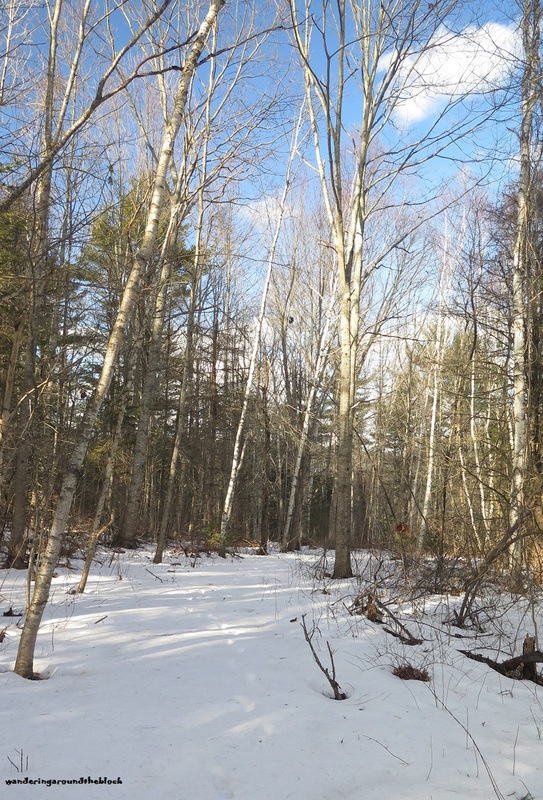 For a number of years now, there has been statements on the land trust web site that they have been trying to find ways to connect the two sections but nothing has ever happened. Judging from the width of the river I am not sure that they could easily connect the two parts. For now, we continued towards the orange loop. Soon, we arrived at the beginning of the orange loop. There was a lot of blow down and damaged trees in this area and we decided to deal with the tree blocking one portion of the loop at the end of our adventure. 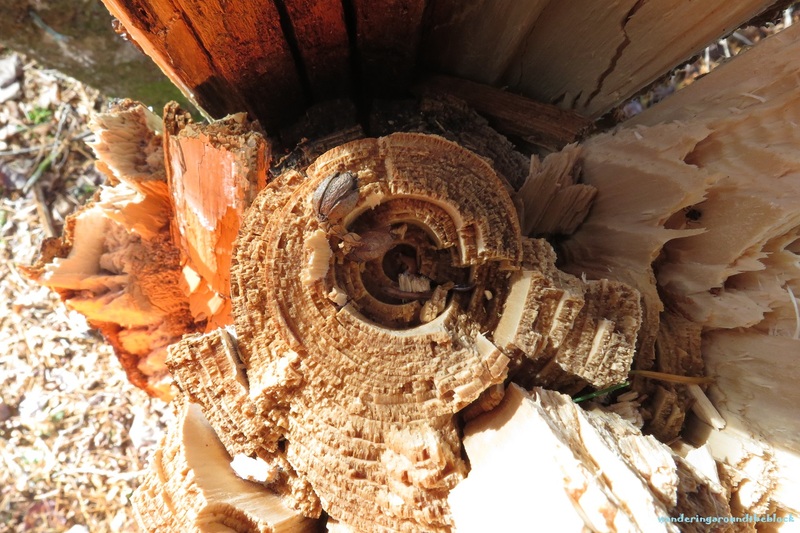 For now, we continued straight, stopping to admire the artistic swirls within another freshly downed tree. 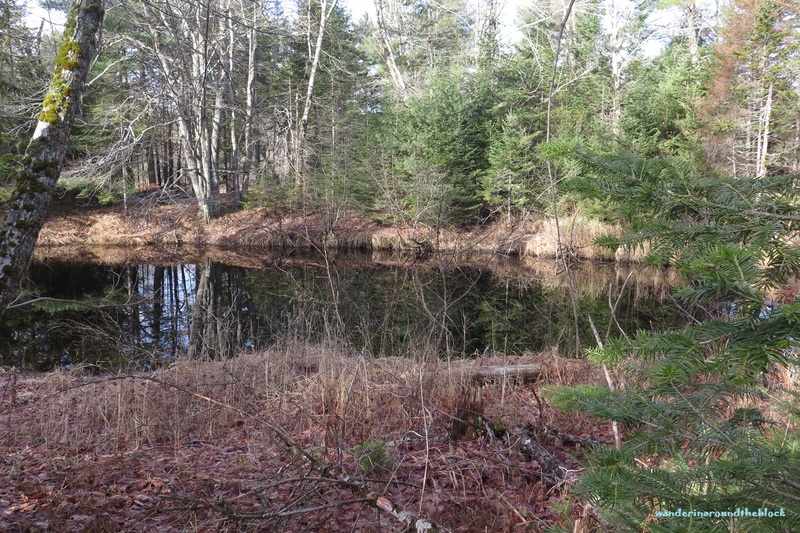 At the first intersection with the yellow trail, we opted to continue on the orange trail but did side-step onto this trail to study a vernal pond not that far in. Making our way around the orange loop, we noticed that this section of the preserve consisted of cedar, white pine and spruce trees. There were quite a few elongated pine cones on the ground which we assumed to be from the white pines. 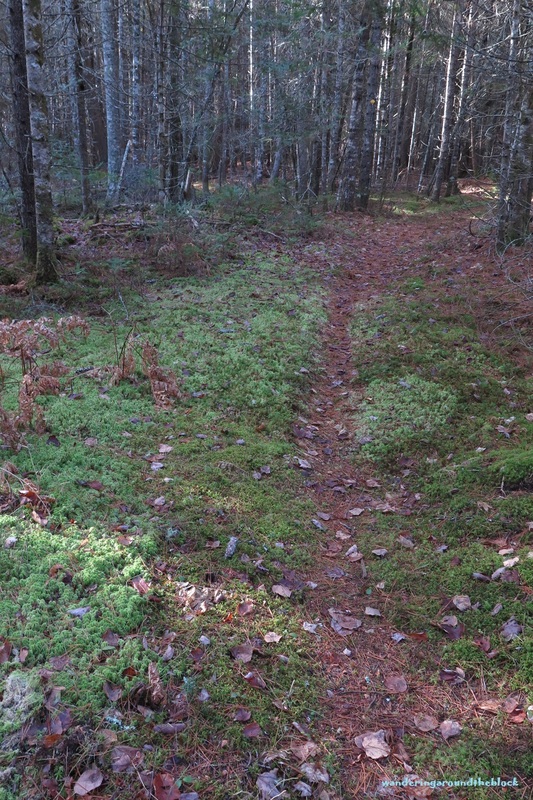 Turning on to the yellow trail, we continued to notice the various conifers above and the mosses below. At some point we crossed a bridge and I noticed from my map that we completely missed the blue trail. 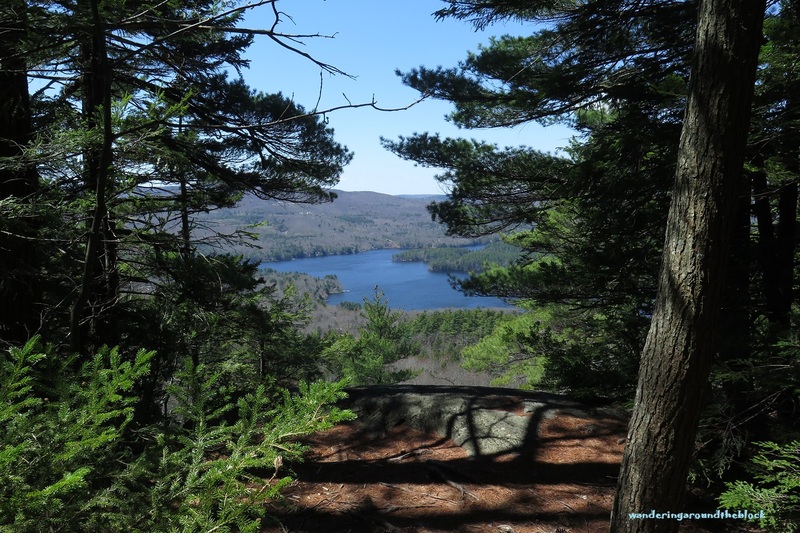 We turned back towards the bridge and looked across the water where we could see blue blazes deeper in the woods but there had been no sign of a turnoff towards that trail either at the bridge crossing or further up the trail. Since we had already passed both places where the trail intersected the yellow, we decided to abandon the exploration of the blue trail and headed back towards the entrance. We made our way around the downed tree where the yellow trail met the orange, managed to avoid falling into the river that made up the road leading back to our car and heading home for lunch. It had been a beautiful hike. 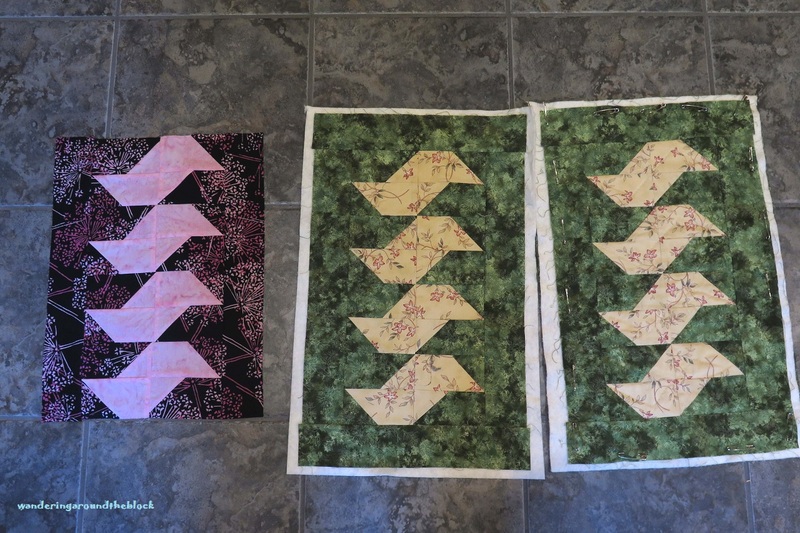 Normally, I am the type of person who is pretty obsessed about finishing one project before beginning another, so what am I thinking to have 4 quilt projects going on at the same time! And if 4 assignments are not enough, I still need to attach a label to the comforter I finished in the spring. I must be crazy! Either that, or like a wooly caterpillar that puts on an extra layer of fuzz to predict a bad winter I am lining my nest with things to do during the inclement winter months. Just a theory. So, how did this happen? I am currently still working on my Friendship Twist quilt. It is half-way through the hand quilting phase and I would like to get it off the quilt frame before the holiday guests arrive in December. But sitting in front of the frame one day, I thought about another donation quilt. Soon enough, I am in front of my fabric cabinet pulling out contenders for this gift. I am told that charities are very appreciative of receiving items geared towards boys, so out comes a dinosaur print and matching material. In the meantime, knowing how annoyed I was to discover a black water ring on a bedroom night-table that was brand new, my husband has stripped and refinished the table. With this in mind, I pull some fabrics to create table mats for both guest room night-tables and a small display table near the living room. The guest room tables will be a light tan floral print surrounded by a green leafy material. Because these table are larger than the display stand, I will add borders on each side. These mats are currently assembled and I am in the hand quilting phase. I would like to have at least the covers for the guest rooms finished by Christmas. 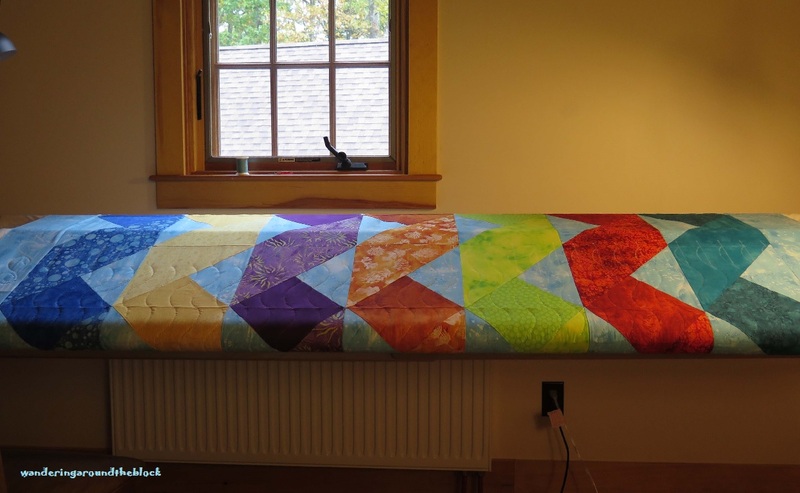 A quilt blog that I read regularly, From My Carolina Home, just put up a quilt along pattern for the month of October. 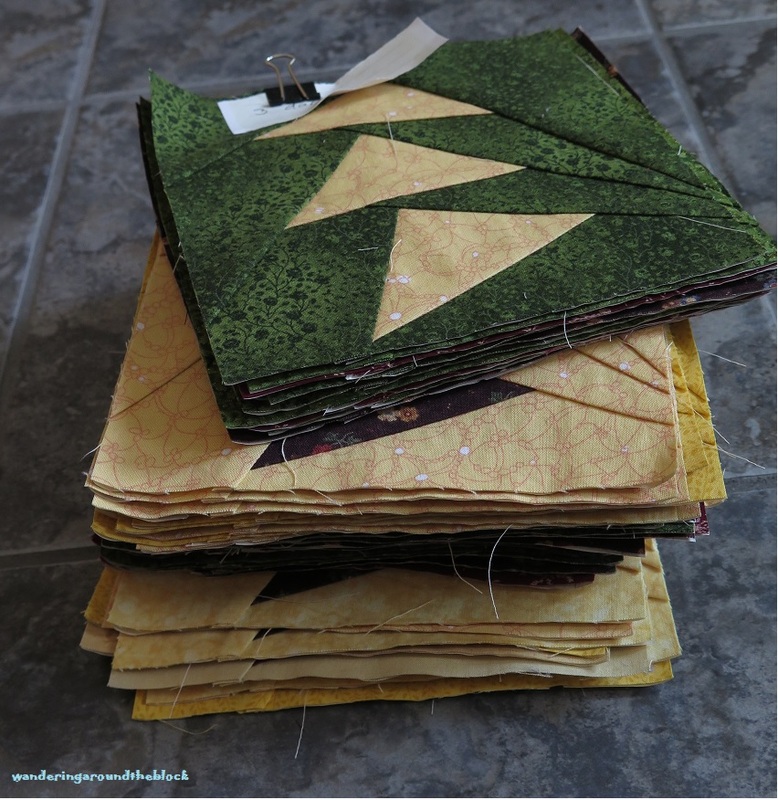 I am so excited by the colors and patterns for this Stars on Autumn Lane quilt that I pull some Artisan Landscape oranges from my stash to get started. I decide to reverse the background from light to dark and pull a green to compliment the oranges. I may call my project Autumn Stars. My first task on the last three activities is to prewash the fabrics with color catchers and make sure they do not run. 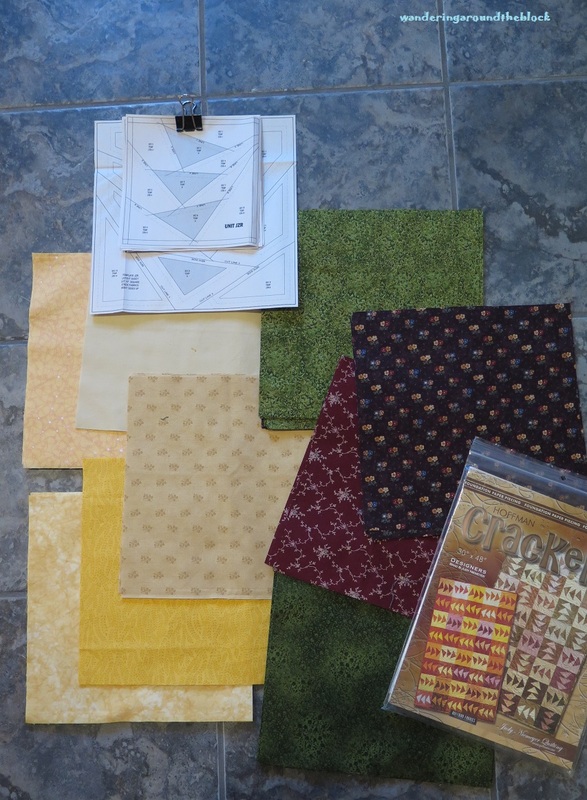 The place-mat fabrics are fine, but alas the greens for both the donation and autumn projects turn the color catchers green. 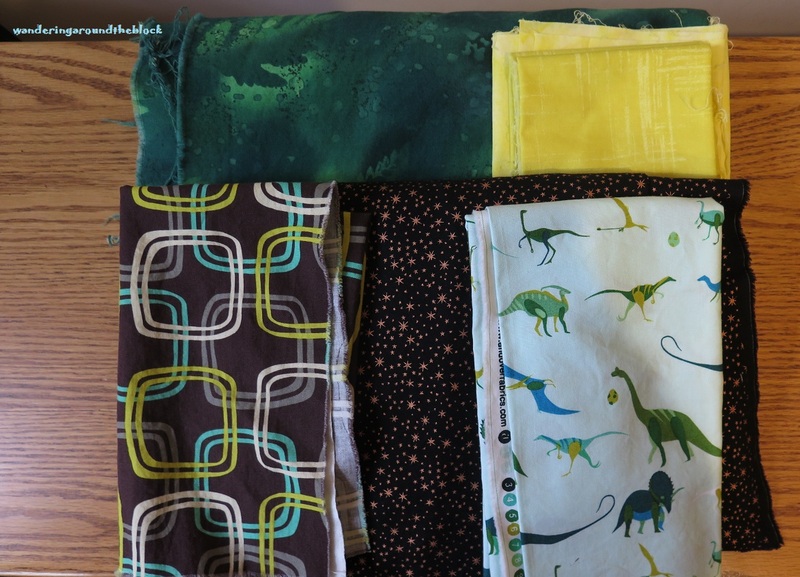 In addition the brown fabric with interlocking squares and the black with stars for the dinosaur quilt also run. Fortunately, as mentioned in my Fabric Color Story, I have discovered Retayne which is a dye fixative. This does mean that I have to spend a morning treating these fabrics in the utility sink, then re-washing them in the machine with new color catcher sheets. 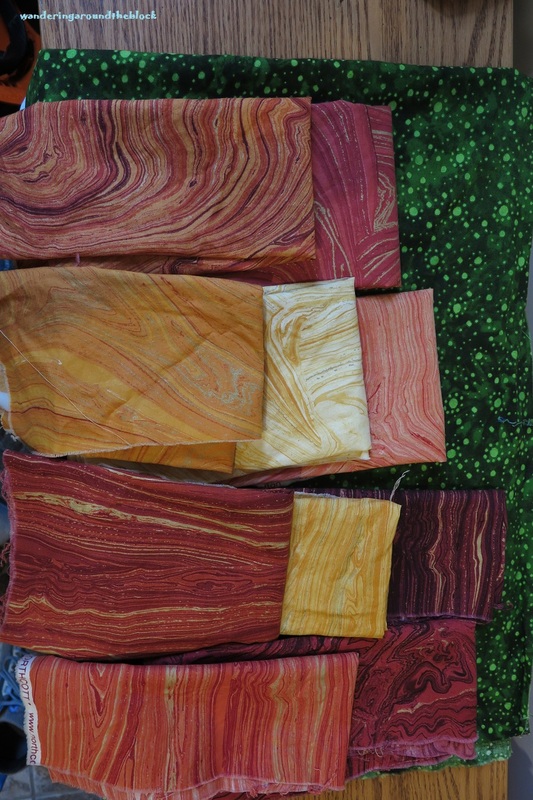 To be on the safe side, I decide to save a step and just treat the Artisan Landscape orange fat quarters. As expected the sheets come clean in the next washing. I am now ready to cut pieces for the dinosaur and autumn quilt. As I am telling an acquaintance about my one project at a time philosophy and going crazy with 4 (or 5 if you count the quilt that needs a label) simultaneous assignments, she stops me and says, “oh so you are now a quilter”. So with multiple works in progress for the first time in my life, I have finally become a quilter.